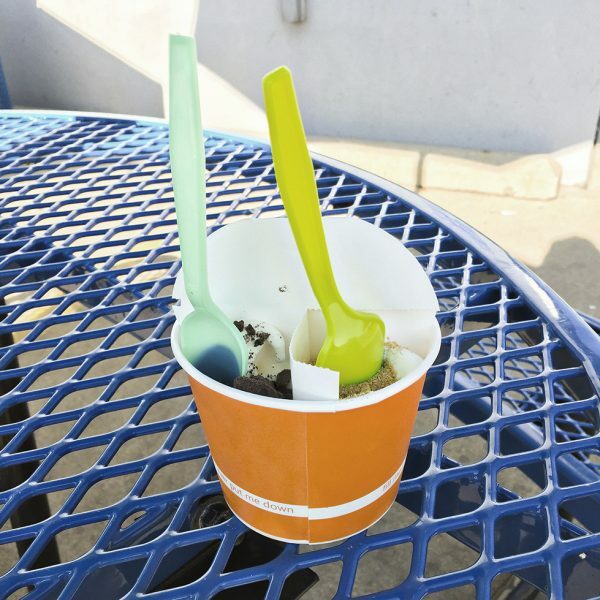 A Blue Ash gas station has a tasty surprise inside. (It’s not frozen burritos. But they probably have those too). 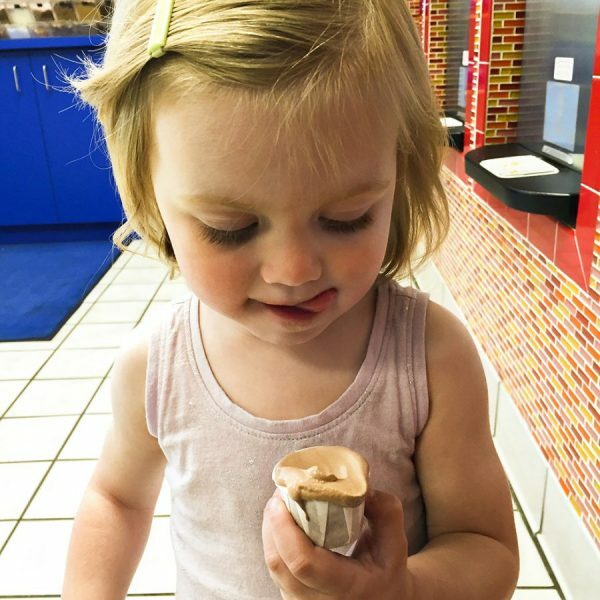 Soft serve is experiencing something of a renaissance. And even though Cincinnati isn’t totally in the game (what gives, Pinkberry? ), we still have a few cool places popping up around town. 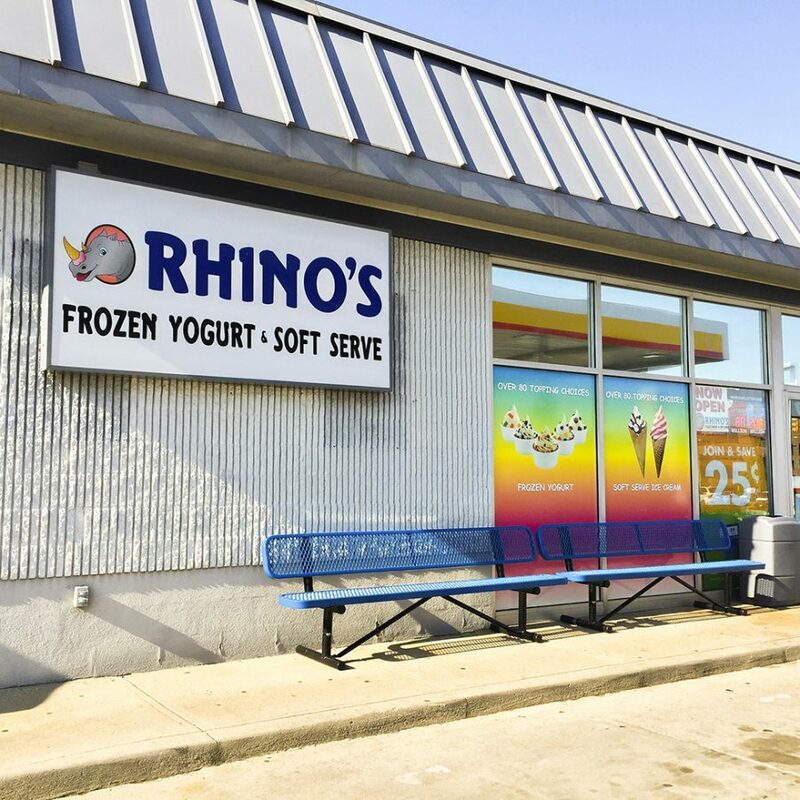 So when I spotted Rhino’s Frozen Yogurt & Soft Serve, which takes up fully one half of a Kenwood Road Shell station convenience store, I literally turned my car around to investigate. Once inside, I realized that my toddler and I would not be leaving without a cup or two. Along the back wall sits a gorgeous array of 27 self-serve flavors, including wacky-but-delicious combinations like Cherry Cinnamon Roll, Valencia Orange Sorbet, and Yellow Cake Batter (sans salmonella). And of course, basic chocolate, vanilla, and swirl. There are also something like 100 toppings, which are separated out into a pantry-style bar (for shelf-stable stuff), and a cold bar (for fresh fruit and meltables, like teeny peanut butter cups). I challenge you to find any meaningful gaps in this topping selection: There are butterscotch chips (and chocolate, peanut butter, and vanilla). There’s candy (Hot Tamales, Mike & Ike, Swedish Fish, and so on). There are bulk bin-style ingredients, like shredded coconut, pecans, and dried banana chips. And best of all, there’s cereal: Cinnamon Toast Crunch, Fruity Pebbles, and the highly inspired Lucky Charms Marshmallows. That’s marshmallows only. If you’re not paralyzed by choice, then you can get really creative here. Cheesecake with Nutter Butters? Do it. Dark Chocolate with fresh raspberries? Elegant choice. Cookie Dough Cake with Cap’n Crunch? Follow your heart. 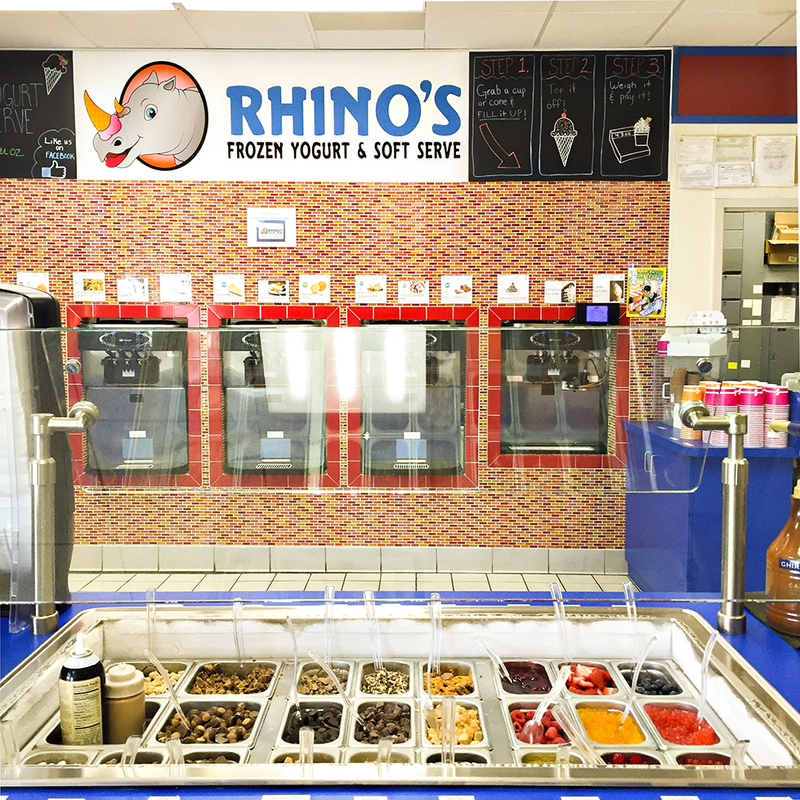 Rhino’s has all the soft serve bells and whistles, from cup compartments to color-changing spoons. My favorite part about this shop (besides the color-changing spoons and the fact that it is super clean inside) is that it’s family-owned. Owner Rob Miller, who also runs the Shell station and adjacent repair shop, says that the property started out as a Texaco in the 1970s, which his father leased and operated. When the brand left Ohio in the ’90s, Miller bought the station. But he didn’t stop there. “It’s always been a family dream to do ice cream,” Miller says, so eventually he took the plunge and invested in some machines. 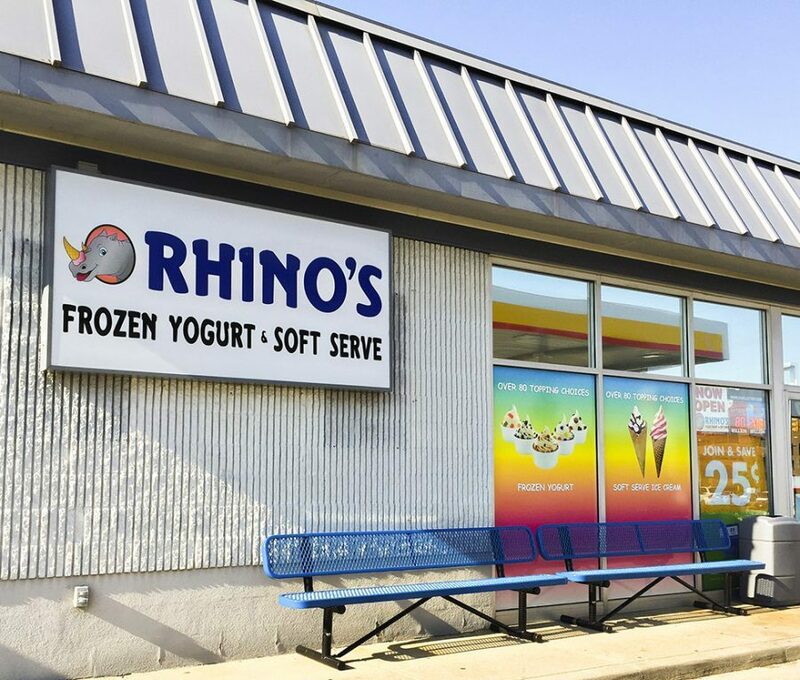 This is Rhino’s second full summer in operation, and business is looking good: “On weekend nights in the summer, we have 35-40 people out on the patio,” Miller says. And his son, Ryan (whose football nickname inspired the shop name), plans to help roll out a mobile self-serve ice cream trailer to bring frozen yogurt to the masses. For now, we’ll just be going back to the flagship location every weekend until Labor Day.